(Press TV) – Syrian forces have been making preparations to raise the national flag over the southern city of Dara’a as a major counter-terrorism operation nears an end, with foreign-backed militants leaving the region in negotiated surrender deals. Witnesses told Reuters that Syrian army vehicles, accompanied by Russian military police, had managed to enter Dara’a on Thursday. 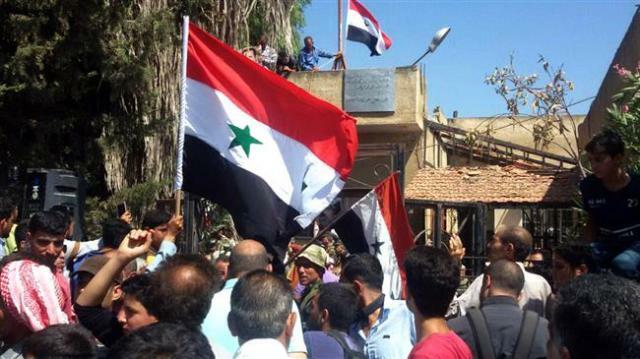 They said cranes from Dara’a municipal council had erected a flag pole near the mosque in Dara’a, where the Syria crisis erupted back in March 2011. Since June 19, the Syrian army has been conducting the operation in Dara’a, which borders Jordan and the Israeli-occupied side of Syria’s Golan Heights.